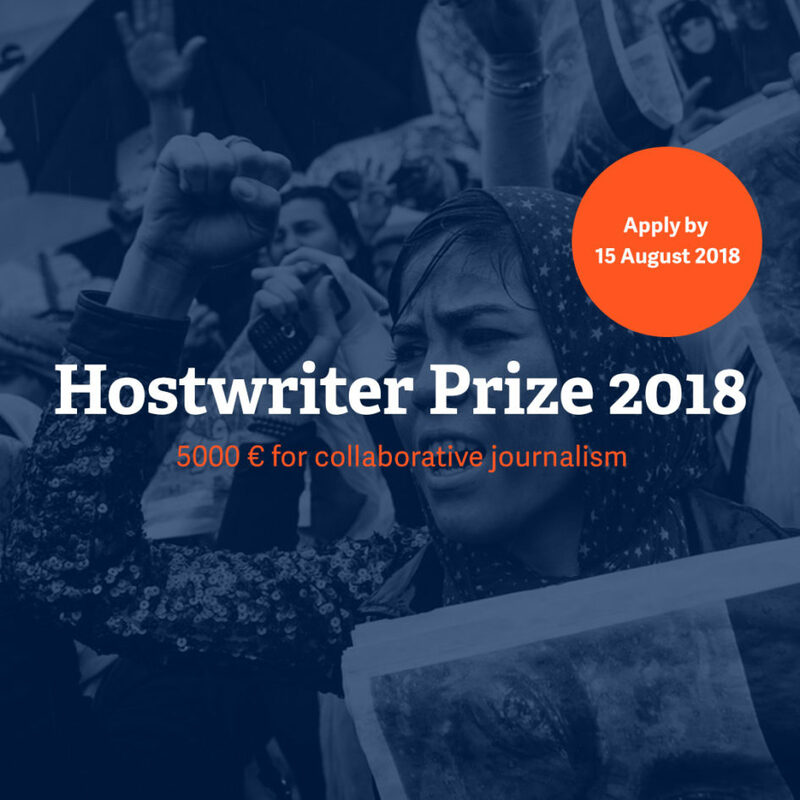 (Berlin, Germany) 23 July 2018 – Hostwriter is now accepting applications for its 2018 Hostwriter Prize, which grants €5000 in awards for collaborative journalism projects between members. The deadline to apply for the prize is 15 August 2018. The Hostwriter Prize consists of two categories. The Story Prize presents awards for collaborative projects that have already been published, with €2000 going to the first prize winner and €1000 going to the second prize winner. The Pitch Prize awards €1000 each to two collaborative projects that have not yet been realized. Recent winners of the Story Prize include Qian Sun and Adrienne Surprenant for their story, “Left-handed Chinese, right-handed village: Two worlds of Blaise, tribal chief of Cameroon,” published in The Initium, and Lorraine Mallinder and Nathalie Betrams for their story, “Trans people are risking their lives in Istanbul,” published by Public Radio International. More info on last years’ Story Prize winners can be found here. The Hostwriter Prize was established in 2014 and is supported by an annual donation from the Otto Sprenger Stiftung, a foundation that honors the work of Otto Sprenger, a former unionist and employee of the NDR (the German public service broadcaster). Hostwriter is an open network that helps journalists to easily collaborate across borders. We connect more than 3,600 journalists from 135 countries to seek and offer help, whether in the form of local advice, story collaboration or accommodation. We see cross-border journalism as a tool to overcome national bias and prejudice, ultimately contributing towards better informed, more accountable and democratic societies. For more information, check our press kit, including high-res photos.